It’s always a pleasure to have guests here at Dag-Lit Central. Today I’m pleased to have Tim Flanagan here, talking about how to visually involve the reader. Stand above the crowd – visually involve the reader! How can you create something that stands out from the crowd? Especially when the number of books increases on a daily basis. Well, for my latest book I decided to create something that was not only a journey in words, but also a journey for the eyes. I have always written in a style that is particularly visual, so it only seemed natural for me to one day get those words converted into pictures. But not in the form of a graphic novel. I wanted the pictures to not only illustrate a story, but also feed the imagination of the reader, take them into the story and involve them. If you want to coin a word that is used a lot these days – I wanted the pictures to be interactive with the story and reader. Sometimes book illustrations can be too sterile, like they are looking down on a scene from above, making a statement that the viewer is nothing more than a silent observer. Thinking back to my childhood, I enjoyed regular comics, but the ones I loved most of all were those that had additional things happening on the page, other than the story. The Where’s Wally books are popular with children, not because they are amazing pieces of art, but because they involve the reader. I came across an illustrator on Twitter who liked my writing and was working with children at the same time that I was. In fact in the same week we were both talking to local school children to inspire them in writing and artwork. We talked about working together and began bouncing ideas around. I resurrected a story I had written several years ago about an eighteen year old detective, rewrote it and presented it to Dylan. We took each chapter separately, breaking down ideas for illustrations and colour scenes for him to work on. In the end we had too many illustrations and had to cut quite a lot for the final book, but the important ones were always going to be the colour full page scenes. These were the ones readers can glance at to supplement the story, or study to find the extra information and additional jokes that are added in the background that the main characters are oblivious to. These are the sort of pictures that I loved as a child that would make me get my pens out and copy. The Curious Disappearance of Professor Brown is aimed at middle grade and teens, perfect targets for the illustrations. Working on this project with Dylan is only the beginning; we have other ideas for the future. The style of writing and illustrations set our book apart from the other reading material for young adults creating an individual brand image that is easily recognisable to readers. 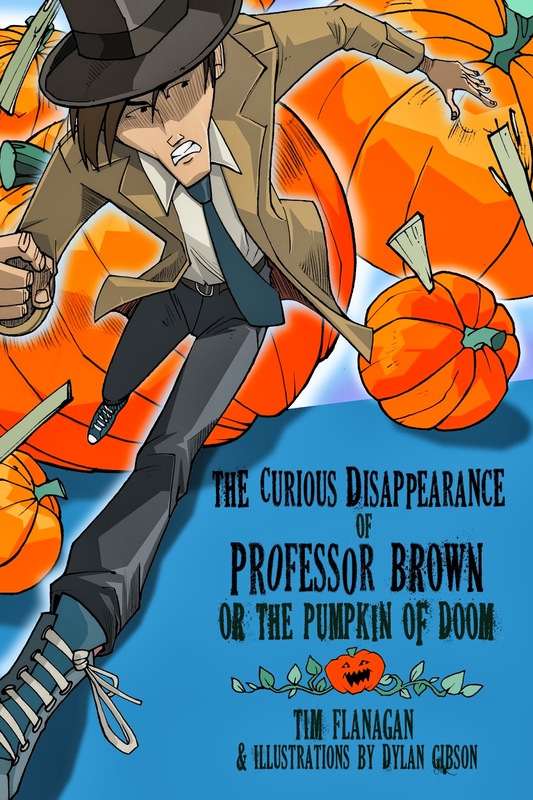 The Curious Disappearance of Professor Brown, or The Pumpkins of Doom. Eighteen year old Lawrence Pinkley is Whitby’s greatest Private Detective. In fact, he’s Whitby’s only Private Detective. Pinkley’s skills are called into play in the first case of a reluctant career. 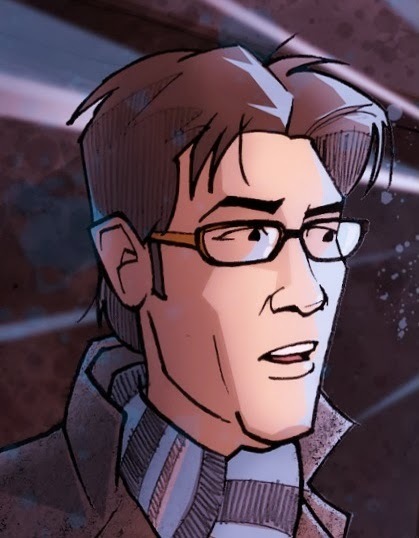 One night, in a high security laboratory, a scientist mysteriously disappears, leaving behind an overly nervous assistant and a trail of pumpkin juice. Pinkley is hired to investigate the disappearance by the professors beautiful daughter, forcing him to quickly learn the skills he needs to solve his first major crime. But every move Pinkley makes is being watched. As he blunders from one clue to the next he stumbles across secret messages, talking pumpkins, the Russian mafia, and hired hitmen. His life now depends on him solving the case. Not to mention the future of mankind! At some point in Tim’s childhood, he was abducted by aliens and sent on a voyage of knowledge and discovery across the universe. Eventually the aliens realised how pointless this was and, as a failed student, he was returned to Earth and left with a family who brought him up as a human bean. But, the persistent memories of new worlds, dragons and other creatures, continued to knock at his frontal lobe, desperately trying to break out. To avoid making a mess and calm his imagination, Tim began writing as a way to communicate with Earthlings. Fuelled by Chilli and Nachos and a bottle of wine, Tim manages to balance a love of loud rock music and fast cars (preferably red!) with emotional chic flicks, smart leather shoes and a well tailored suit. He has successfully infiltrated the humans and hides behind the façade known as a family. He learns from his children, but is regularly told to stop acting like a child by his wife. Naturally shy and unsociable by nature, he is selective of the human company he keeps, preferring to be around old books, bonsai and art. He cries at ‘It’s a wonderful life’ but sulks if fed evil vegetables disguised as Parsnips or Peas. He is bored by mundane conversation, excited by architecture and castles and fuelled by Caramel Latte Macchiato’s. Occasionally, he likes to catch up with old acquaintances on Tatooine, Westeros, and Middle Earth, and stare at fantasy and concept art as if it is a window to his childhood adventures. He is always trying to learn lessons from the masters; Mr Charles Darwin and Mr Lionel Ritchie, about life and love. Tim’s galactic mission is to translate his brain activity into a language that inspires and entertains you, transports you to different worlds and grants you an audience with the characters you have dreamt about, but never dared to remember. All of this in an attempt to redeem himself with his childhood alien abductors and travel the stars once more. My blog is the best place to get an insight into my mind. There are various posts and videos that have nothing to do with writing, sometimes just things that made me laugh or made me think. Join my mailing list. I don’t do spam so will only contact you when I have a new book release.